This morning, we were awakened by the sound of the pitter-patter of raindrops blanketing the island. This usually is a delightful sound to wake up to, unless you’re on summer vacation…on a tropical island paradise! This has always been my nightmare, that rain will spoil a much-awaited, much-prepared for, much-saved up for holiday, the way we spent our Koh Samui vacation a couple of years ago in our resort room as the island was battered my torrential monsoon rains. Thankfully, it wasn’t the case. The rain eased up by the time the sun came out, and soon the sun was on full blast, the way it has been the past three days, allaying any fears of being rained out. So soon, we were swimming and sunbathing as we had the past day, and finally got to some reading. I decided to continue reading “The Life of Pi”, which I never really enjoyed, so I stopped reading after a few chapters, but now I find it a gripping read. I guess being so close to India, and the fact that we’ll be out at sea for the next three days, makes the story a little more apt, a little more gripping (although the whole boat sinking story arc doesn’t really sit well with me, given our looming boat jaunt). I devoured the book too fast, that I had to stop myself. I only brought three books and I’m almost done with two. And I don’t think the last book will last any longer. We spent the afternoon sitting on our beach chairs, watching the sun set. It was hella romantic. 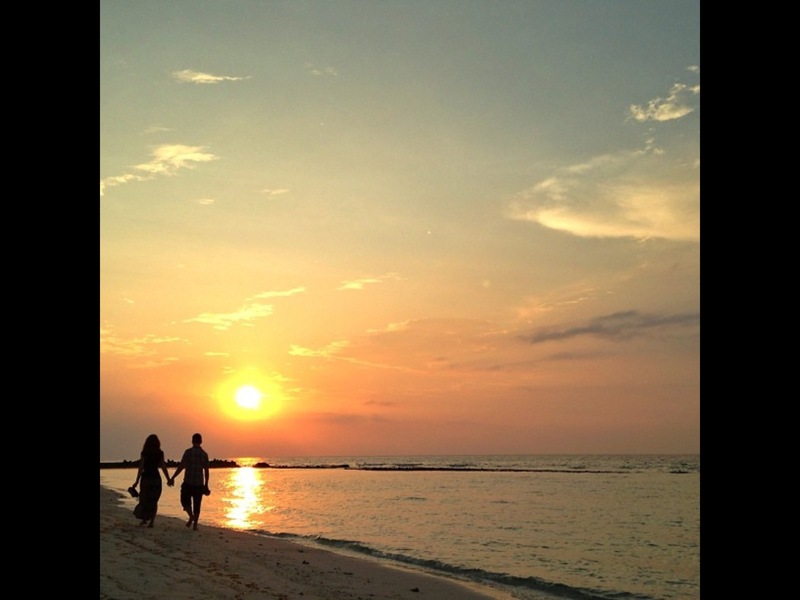 Couples were drawn to the sunset like moths to a flame, walking along the shore, mostly holding hands, bathed in the warm orange light of the setting sun. If you were friend-zoned, bring him or her to this spot and I guarantee you, makakatikim siya ng malisya! We’re spending our final night in the Bonthi area of the resort, so we found our check out letter on the bed, and our table in the Bonthi restaurant had a table cloth that said, “See you soon!” on it. We spend the next three days on a wooden yacht, then transfer to the Sangu water villas for our final four nights. Like most dream holidays, this one is zooming past way too quickly. One can’t help but feel melancholic once hitting the halfway mark, like lamenting a delicious meal that’s been half-eaten. Trying to enjoy the present, the now, instead of dreading the looming end, but it’s a hard task. It’s like trying to enjoy a summer love, knowing you’ll eventually part at summer’s end. I’m weird like that, I usually get depressed on the first day of a nice vacation because if it starts, then it means it’s also about to end. I don’t think I’ll have a blog entry for the next two days, because I don’t know if they have wifi on the yacht, so maybe I’ll post three days worth when we get back to land? Pi Patel had a tiger with him on the boat. I have a Baby Whale. Talo siya. Talagang may malisyang magaganap ha. =) Take care offshore. tsaka si baby whale pwede ka isubo ng buo at iluwa ng buo pa din parang si jonas lang hehe eh yung tiger?! i know you are enjoying much so keep posting and blogging! 🙂 we miss you though, every morning. Hmmm…i smell salty wedding bells :))) Puro malisya lang talaga dapat pag ganyang mga getaway. Enjoy ang stay in love!! BTW,it’s good to have you blogging again.